1000 Pieces. Finished size: 27" x 20". Artist: Nicky Boehme. Some of the pieces were bent when I opened the box. I love these puzzels, not too easy yet not really really hard.. I have a puzzel up all the time, love doing puzzels. Christms is my favorite time of year. 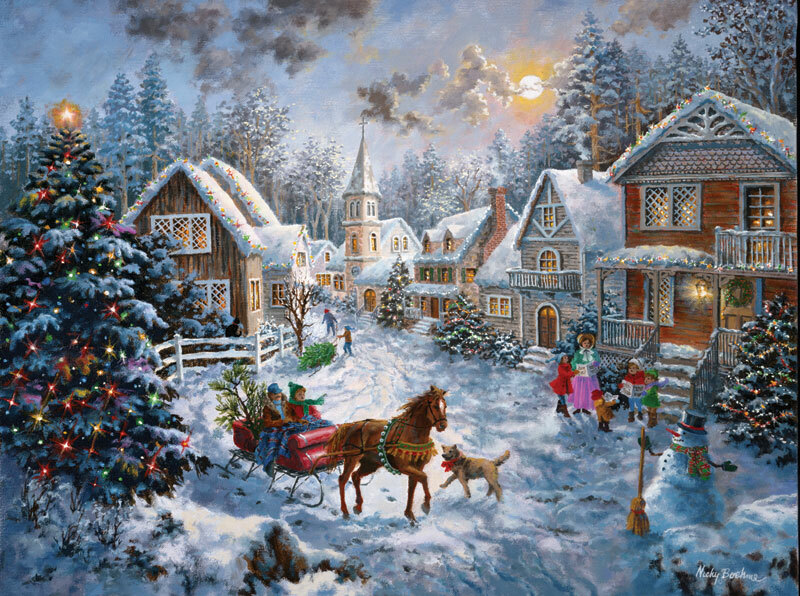 I always have a Holiday puzzle going at this time and this one is truly lovely. I purchased this puzzle for the Christmas holidays as our family enjoys puzzles around the fireplace. It's such a warming and fun project. We are looking forward to putting this beautiful puzzle together! I have not worked this puzzle yet, but it looks like it will be fun. Had my first chance to visit your store and I will be back. I live in Springfield, Illinois. Your store is a puzzlers dream!!!!! It's just beautiful. Can't wait until Christmas to hang it up on our wall. The picture is very colorful and has everthing on it for the holidays but the pieces are too small and it will be a challenge to put together!!! I ordered a puzzle 2 days before Christmas and my sister opened her door Christmas morning and low and behold there was her puzzle on her steps. !!! great! I thought it would be there after Christmas. She loved it! Thanks!! 5 Stars Bonnie Grenier - Two Rivers, WI. I was surprised and pleased with just how fast my puzzle arrived. I will be ordering from you in the future. Thank you.